The minute Halloween is over the shops immediately pack up the pumpkins and replace them with the start of the Christmas goodies. I couldn’t help having a look and spotting any new seasonal items. First thing to note was that there was a lot of old favourites back on the shelf. Terry’s Chocolate Oranges, Nestle Penguins filled with Smarties, Milky Bar Polar Bears etc. 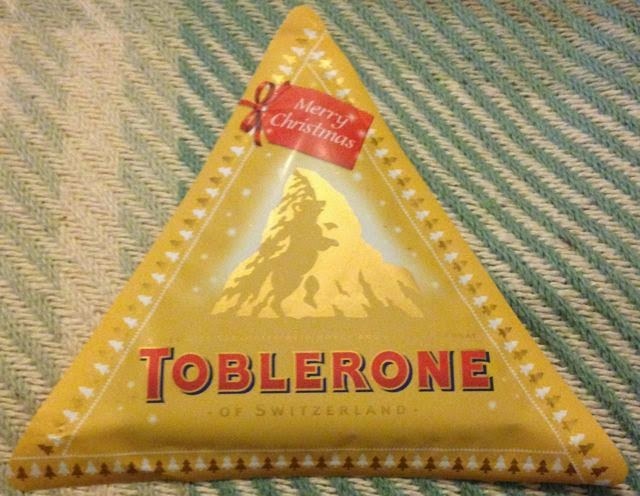 I couldn’t see any new Toblerone flavours, but this particular Christmas novelty definitely shows a bit of a special shape change. It looks like someone took a piece of Toblerone and pushed it under a steam roller! The bar is flat, very flat! It is also disappointingly just a little to big to be put in a Christmas card as an extra, as they could have been perfect for that. The packaging on the bar/slab unpeels to reveal a flattened Toblerone, with pieces that can be easily broken off and shared. 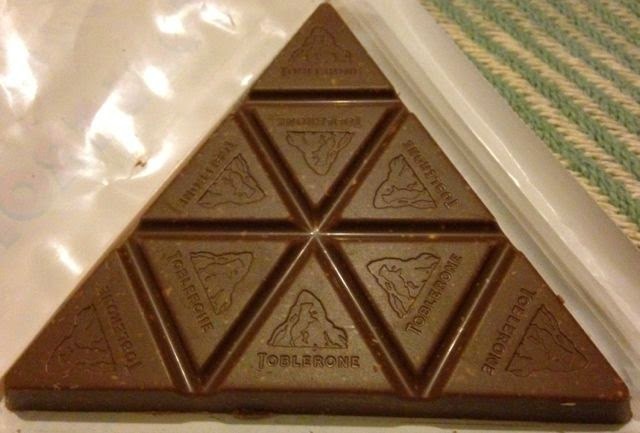 Anyone who has been lucky enough to eat a big Toblerone will understand the awkwardness of the three dimensional bar. The chunks are difficult to break off, with the gap not seemingly big enough to pull at with fingers, but the chocolate is so thick you need a bit of strength too. Then when you have your chunk off, the pieces aren’t easy to eat either, again being difficult to break with your teeth and the piece being too big and thick to eat without breaking it up. Having said all that, isn’t that part of the essence of what makes Toblerone fun, and gives it its character? I like the fiddliness of the proper chocolate Toblerone and the fact the makers packed away the book on ergonomics before they began! It is easy to eat in its new format, and the taste is still perfect. The milk chocolate is rich, sweet creamy, and there are plenty of honey nougat bits and nuts, so it was a very enjoyable bar. The flavour was still there. If you have ever been put off buying Toblerone because of its shape this is the bar for you, it has novelty factor too – squashed Toblerone, but I think I like the chunky bars best!